We went on a brothers and sisters and girlfriends trip to into the West last weekend, to visited my cousins and my cousin’s new babies. Babies are great fun… although we did have the thing of “how on earth do make it stop crying?” at one point when we were left to look after the younger one. Interestingly shoving a full size football in the face of a 6 month old baby is good way to stop it crying for a little while. Flicking through the photos really quickly on my digital camera also seemed to have a good hypnotic effect. But on this occasion the baby was not going to stop crying until its mum returned. We visited in the Eden Project on the Sunday, a big set of domed greenhouses with a whole rainforest inside. It was forecast to rain. 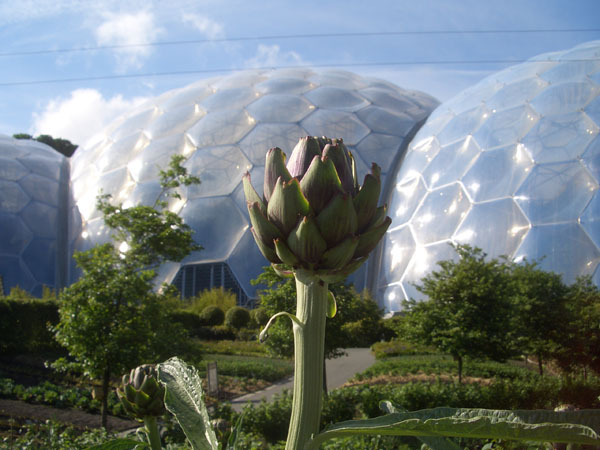 Eden Project probably does very nicely out of rainy weekends in Devon. They were certainly packing in the paying visitors (£15 each) on this bank holiday. I suppose its one of the few big days out in the area, which is (mostly) indoors. It must be very profitable now I reckon. It would have been expensive to build of course, but with the ticket tills ringing like this, they must’ve reached their break even point a long time ago. In the end sun came out, as you can see in this glorious picture of an artichoke. I could rant about google abandoning its principles of elegant simple clarity in favour of cutesy gimmicks, but let’s face it, they are kinda fun. If you click on the image, it takes you to a google search on the topic, to reveal what the image is all about. 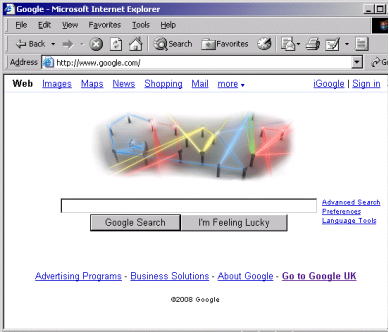 In this case they were commemorating the invention of the first laser, and so you are taken to a search for “first laser”, which predictably enough brings up wikipedia’s Laser article as the first match, to provide a useful explanation “The first working laser was demonstrated on the 16th May 1960”. …but wait! It’s also showing some sponsored links. Laser related websites? Well no actually. 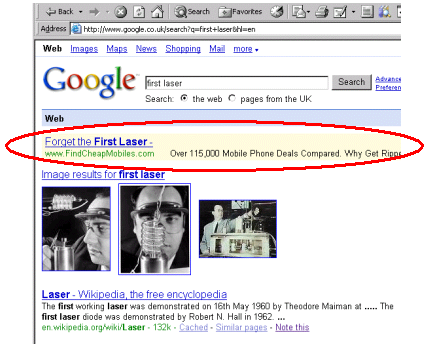 The topmost prominent sponsored link says “Forget the first laser… findcheapmobiles.com”. These bozos have registered a particularly sneaky ad word to direct a large slice of this web traffic onto their unrelated website. Clever advertising, or an abuse of the system? Google obviously decided this was an abuse. A few hours after I took this screenshot, all the sponsored links disappeared from the “first laser” results. I’d be inclined to agree. The site is not related to the search, and actually in this case users aren’t even searching, they’re just wondering what the image is about. Also clever though, and an interesting of example of google having tricks played on it, not just by blackhat S£O sp@mdexing scam artists, but by their own customers. Stinking hot weather in London at the moment, so the BBQ came out on Saturday, and so did the hammock! Francine and the brazillian ladies came round, and I tried out my caipirinha making skills with my wooden lime crushing thingy. 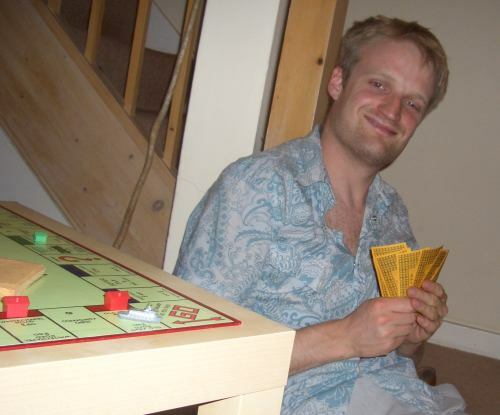 In the evening we played monopoly, and I won! (the first time I’ve won monopoly in a long time) I kind of felt bad about beating them because they were all new to the game, or hadn’t played it as many times as me, so I should’ve let one of them win really. They probably thought I had beaten them easily with my superior monopoly playing tactical experience, but no! I’ve never been convinced that this game involves much skill/tactics at all. I just happened to be more lucky this time. The weekend before last we went on an organised walk and talk called Three Mills Loop around Bow in East London. It was organised by Gordon Joly, who is someone I meet up with at wiki gatherings. He’s a prolific photographer of random bits and bobs around London, as indicated by his flickr photostream which literally streams a constant flow of new photos appearing on my ‘friends photos’ display. But while he was guiding us and talking about some of the sites on the walk, I thought I’d out-photo him on this occasion. I took 274 photos around the route! They were mostly exceedingly uninteresting though, because I was actually doing some photo mapping, so it was pictures of street signs, pubs, post boxes and other mappable things. 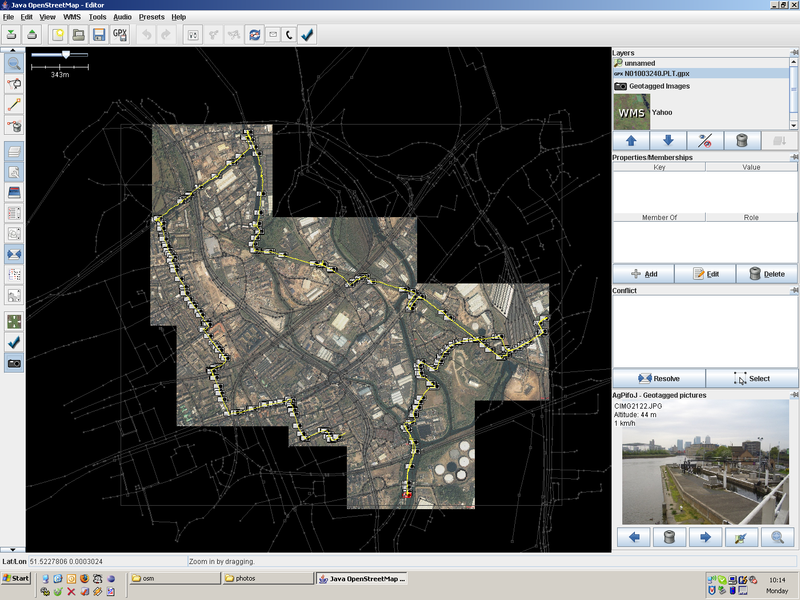 In the openstreetmap software I can lay out the photos along my GPS trace. 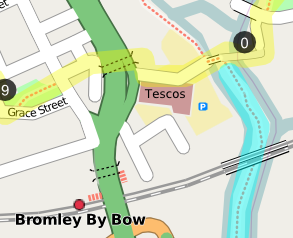 This has been made possible by the recently added ‘Export’ tab feature of OpenStreetMap. Try doing that with google maps! The walk route took us past some pleasant canal scenery, and we passed right through the Olympic construction zone. 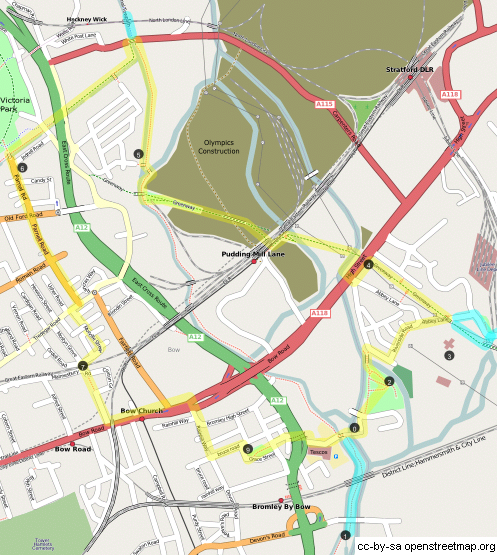 It turned out that the extents of this needed to be updated on the map (although it no doubt still needs some further corrections). This was an interesting sight to see, as was the old Victorian Abbey Mills pumping station.